If Robert Filliou coined the over-quoted expression “art is what makes life better than art”, it’s because there are artists for whom life is something that gets in the way of art, and many art lovers who expect art to be everything life isn’t. The XXth century seems to have been a vast exploration of all the possibilities of this relation, between both extremes of “l’art pour art” and life = art. I sometimes wonder if Marina Abramović falls into the former or the latter category, which is, admittedly, a ridiculous question, as she seems to be all about the complex entanglement of both. As a performance art pioneer, Marina Abramović unabashedly explains in the documentary “Marina Abramović: The Artist is Present” (Matthew Akers and Jeff Dupre, 1h 41’, 2012) how her New-York gallerist Sean Kelly has helped her create something that could be sold – moving and still images, for the most part, documenting or extending her performance work. Therefore, she has consistently chosen to be her work by enacting it and bravely enduring its consequences (that are sometimes taken to a spectacular degree of self-harming) while trying to find a commercial production that financially sustains her. It is all about ambivalence, then, and placing the utmost idealistic goals within the most pragmatic and realistic context of survival. But isn’t this what she makes her work about? Her famous breakup with Ulay, her art and life partner of twelve years, in 1988, became a performance when they decided to start walking towards each other from opposite sides of the Great Wall of China and meet halfway for a final goodbye (The Lovers: The Great Wall Walk, Abramović / Ulay, 1988, 65’32 »). There are images of a heartbroken Marina weeping which, I am probably not wrong in assuming, are perplexing for the majority of us. Too much emotion. 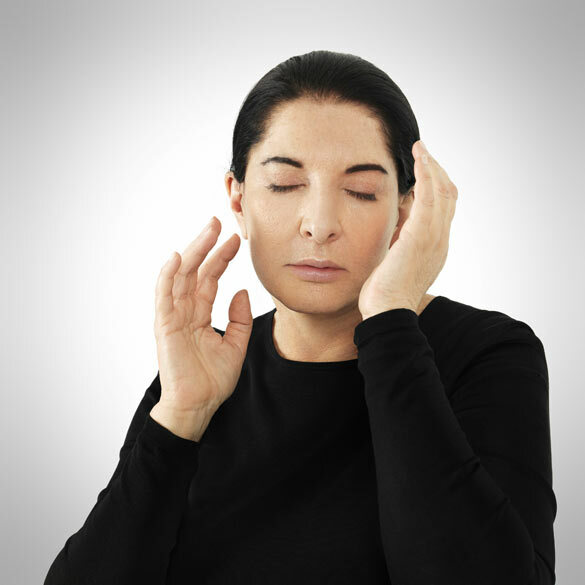 With Marina Abramovic, art and life are intricately related, but it is a bi-lateral relation. The contemporary artist, although relying on a technique of some sort, is the one setting the rules. Marina Abramović’s art is about the one who establishes the work’s premises. Her own life and her own strength as a performer are included in the set of premises for each performance. In the aforementioned documentary, she admits that her relationship with Ulay was affected by the fact that she did not get up when Ulay had to stop the performance “Nightsea Crossing” (1981-1987), for health reasons. In that perspective, I believe that her latest performance work “The Artist is Present” (2010) and the on-going show at the Serpentine Gallery in London, “512 Hours” is a reflexion on former performances where she allowed the spectator to participate such as “Rythm 0” (1974)  inasmuch as it is about making her own body and her own mind available and placing them under the scrutiny and within the reach of the spectator. Moreover, as in “Rythm 0”, this scrutiny is supposed to lead to action; in “512 Hours” the underlying question is: what action am I led to accomplish here, and what does it mean? The meaning, with Marina Abramović is, more often than not, pre-established, and had been caught between love and hate, smothering and protecting for quite some time. However, her latest performances have been about an intangible kind of personal accomplishment for everyone – herself included. They unravel her own evolution as a performer in a logical placement of herself and her personal growth as a key element in her own work. Therefore, it is surprising to arrive at the Serpentine Gallery and find a great amount of “stuff”. Although the artist has declared that there would be nothing other than herself and a few props, the space feels constricted. Paradoxically, a third of it has been allocated to the “stuff” one brings and has to place in lockers, usually after having waited in a queue to get in. Thus, it is without mobile phones, notebooks, tablets or any other modern day object that one enters the space. That is a very important part of the process, one that is not mentioned enough: Marina Abramović knows how to extend the experience of the show, as if it were a dance performance or any other time-based, theatre-bound show. As soon as one penetrates the space, the show has started and our presence is part of it. What are the props the artist has mentioned? In a curious statement, posted on the Serpentine Gallery website, the artist admits to being anxious because English people are “cynical” and mock everything. I would add that, after her famous MoMA show, it would be hard to overcome its level of commitment and restraint. Therefore, one is surprised by the premises of this on-going, all-encompassing performance: not only Marina herself but also other trained assistants guide the visitors through several experiences that take the shape of – broadly speaking – tasks, meditation techniques or dance/theatre formulae. There is one very debated aspect of her work nowadays – and particularly after the MoMA show last year, and her involvement with celebrities such as Lady Gaga (who describes her as being a woman whose “brains are limitless”) – which is the guru/celebrity aspect of mainstream recognition for such a involved artist. For Marina Abramović has achieved, in her own level, to establish a bridge between mainstream and alternative art. She has drawn crowds to the museum and has made them cry. Tumblr pages, blogs, Facebook pages, youtube videos, videoclips, have been dedicated to her art. And although I believe that she wished to be fully confronted with her public without the latent aggressiveness of her early works and to take her art to the next objectless, empirical level, her presence, available, both physically and mentally, will have the cynics say: she is playing out her star quality and rewarding herself for a late recognition that crowns the enduring years of pain, hunger and mockery. Maybe the spectator is available for her and not her for the spectator. If her earlier performances took spectacular pain and effort, the tiredness is now less evident – even if it is definitely there. It is perhaps not entirely Marina Abramović’s fault that the consequence of her fame turned her into a star. Part of me thinks – granted, quite severely – that performance is tainted by visual recognition and stalking fans. Yet, another part of me acknowledges her art’s systematic encompassing of personal life, raw emotion and dichotomy. Fashion and celebrity are now part of her life, as much as spectators are now present in her own performances. What one forgets is that, on the other end of the scope, there is the anonymous viewer, who perhaps would not go to the Serpentine Gallery during the summer if the Guardian journalist Zoe Williams hadn’t wept when she realized that her children were having the time of their life counting rice on a old-fashioned school table in a highbrow venue such as the Serpentine Gallery . Shall we say, then, that rather than Marina Abramović becoming mainstream, it is the mainstream that has been touched by art? She definitely seems to be a stars’ star, supporting Jay-Z’s appropriation of “The Artist is Present” and editing James Franco’s life (as she bluntly put it to Vulture a year ago) in his upcoming autobiographical film. As someone who has decided to embrace everything within her own artistic creations and try to follow her own time, Abramović became the paradigm of all the perks and dangers of exposure for a contemporary artist: what happens to art when it becomes exposed? How can a visual artist cope with notoriety? How is the art market affecting museums? Is mainstream culture influencing art? Her alleged fear of the British spectator may have stimulated her to share with her audience the techniques that her performers had to endure to prepare for her show  last year. She is there and, as far as I could see, unsurprisingly, chooses the most reluctant spectators to talk to or to guide. She looks very focused and tired. As far as I am concerned, I was expecting more, or an experience akin to that of the MoMA. And yet, that is exactly why she is an artist and not a guru or even a star: she seems to do things for herself first, and then for others. She does site-specific, considering the context, and adapts to it. Therefore, and for the first time, visitors are led by the hand and taught to walk slowly. They face the wall or are placed in pedestals. They sit in a sort of classroom counting rice. There are no wrong answers, only a “yes” or a “no” to the challenge. Some people, we are told, spend the whole day in there, others come in after lunch and perform until the end. I can say that I completely lost track of time and spent three full hours in the space, not quite knowing how long I spent performing. wrote Virginia Woolf in a short piece titled “The Mark on the Wall” . The story is built into a stream of consciousness stemming from the uncanny vision of a ‘mark on the wall’ that the narrator cannot identify. Woolf clearly wants us to follow her through the hardships and intense, ephemeral joys of following a good line of thought – and to acknowledge their intricate relation with art and creation. “Never to be interrupted” seems to be the secret and never quite fulfilled wish of both artists and observers. I cannot suggest that Abramović manages to fully accomplish it it; but she certainly diffuses this ideal. ↑ “Rhythm 0” was a six-hour performance at Galleria Studio Morra in Naples during which Abramović allowed the public to use any of the objects displayed on her. The chosen objects were either dangerous or functional. Some members of the audience displayed a harmful and provocative behavior towards the artist. ↑ Williams, Zoe, “How I became a convert to the cult of Marina Abramović”, Guardian website, Saturday, 14th of June 2014. ↑ For her retrospective at the MoMA, she only performed her new piece, having a team of performers reenact her works requiring a physical presence. She trained them for a certain amount of days in her house, not allowing them to talk (at certain times of the day) or using their cell phones. ↑ Woolf ,Virginia. “The Mark on the Wall”, Monday or Tuesday, Hesperus Press Limited, London, 2003 – first published in 1921, Monday or Tuesday was the only volume of short stories that Virginia Woolf published herself. Marina Abramović: 512 hours, à la Serpentine Gallery, jusqu’au 25 août 2014.